That is high, high praise for the Ghost Peek, our newest download. So what is the Ghost Peek? Without revealing too much, we can tell you this: it’s an important improvement on a classic gambler’s peek that allows you to sight a card anywhere in the deck without turning any of the cards over. 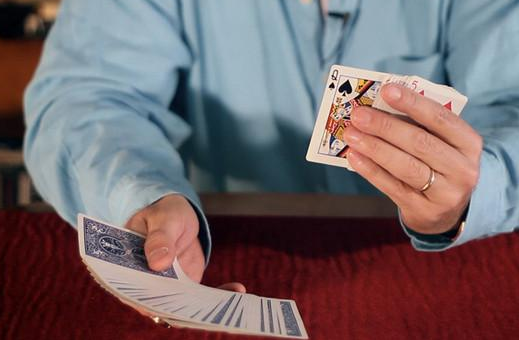 Most peeks occur by tilting the faces of the cards toward yourself, either under cover of a gesture or an action. In the Ghost Peek, the cards remain face down, away from your face, throughout. This peek is not a pipe dream, nor is it an experimental idea. It’s a practical, audience-tested utility you will learn within an hour and use for the rest of your life. It's difficult to demo a move like this, because it's invisible! There is NOTHING to see, and that’s what is so beautiful about the Ghost Peek. This peek has similarities to a technique by Gazzo and is explained with his blessing.